Hatch Dominator riot police gauntlets. I have two pairs, brand new and never used, size Large. Foam padding with plastic splints on forearms, padding on back of hands and middle, ring, and pinky fingers (thumb and forefinger are unpadded), Honeywell Spectra cut-resistant liners. I think these make for excellent rapier gauntlets. "The Hatch Dominator glove is used by police and military personnel throughout the world in need of heavy duty riot control gloves. These Hatch disturbance control gloves with Honeywell Spectra are designed to provide protection for law enforcement and corrections officers during volatile crowd control situations and cell extractions. 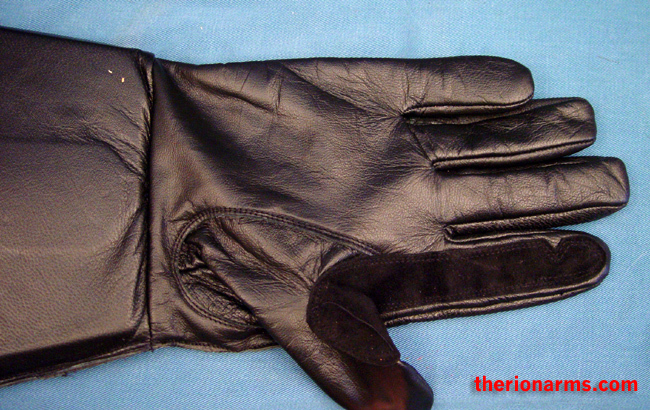 The entire hand of these Hatch duty gloves is protected from sharp weapons with a Honeywell Spectra knit liner, and is also constructed of durable goatskin leather. 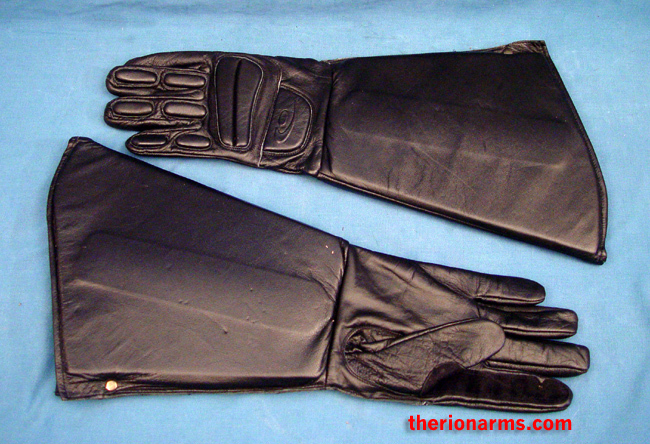 These Hatch gloves also feature large foam padded gauntlets with trauma plates to protect the forearms. 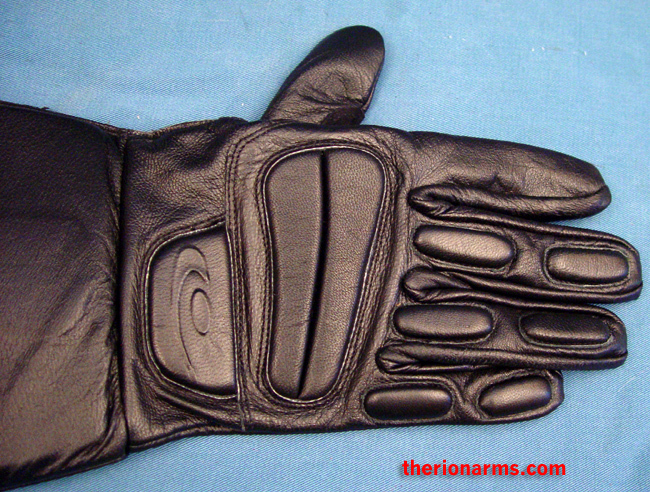 Half inch closed cell foam pads cover the back of the hands and fingers in the Hatch Dominator, while the index fingers are left unpadded for trigger control when necessary. Hatch provides quality gloves and other protective gear for uniformed duty, tactical, corrections, military, industrial safety/medical rehabilitation, and more. Its products are of the highest quality available in terms of materials, construction and durability. Hatch’s market-driven designs incorporate the latest materials and technology for the highest levels of protection and durability available." I think the foam pads are a little smaller than the 1/2" stated above. 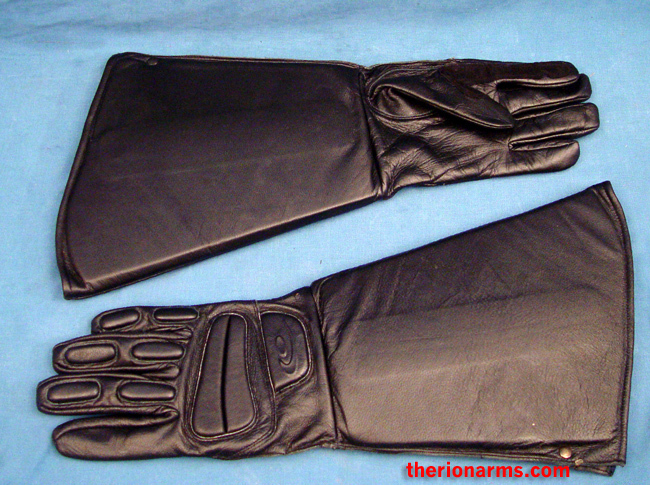 Cut-resistant lining and padded knuckles and forearms? Sounds like rapier gauntlets to me!